Sometimes I think I forget to write about how great Morgan is to Bay. Like last week...Morgan overheard me freaking out about Bay's birthday party and the lack of RSVPs, so he took it upon himself to invite "the good kids" in his class to Bay's party. 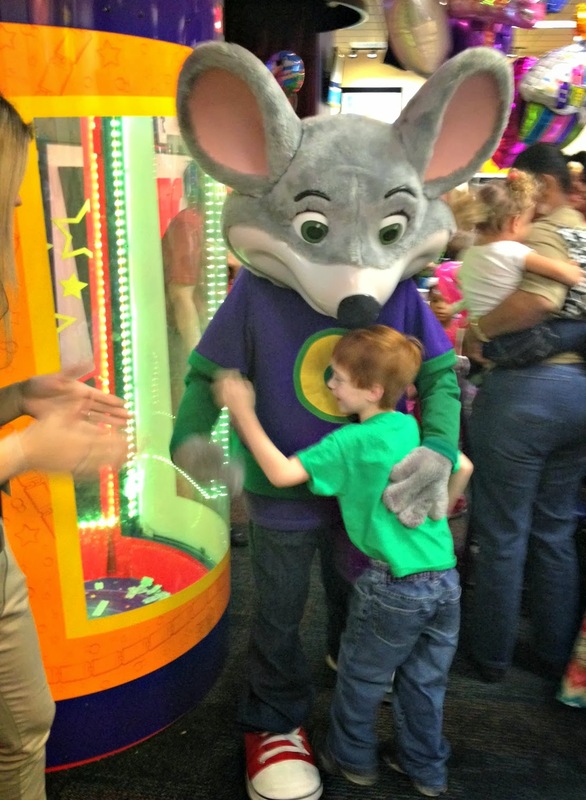 He forgot to tell them the time, date, or place of the party, but he really wanted to make his brother feel special and that he thought to do so was great. When he told Bay in the car, I caught my youngest son's eye in the rear view mirror. He'd teared up and was holding hands with his big brother, thanking him for being "the bestest big brother ever." I asked Morgan why he invited his friends to Bay's party. He said, "Remember that party? The one where lots of people said they would come but only two did?.... that hurt my heart. I don't want Bailey's heart to hurt." The party he spoke of was one where no one from any of his classes came, but two kids from his soccer team did. I didn't even know if he remembered; we don't speak of it. Clearly, he does remember and clearly, he doesn't want his little brother feeling that kind of hurt. When Bay thought that he'd lost his kraken, Christmas, that same week, Morgan offered to lend him his extra Ted. People, that's huge. Ted is like an extension of Morgan's stimmy hands and soothes him. That he has another now doesn't matter- he was willing to spare him for a day or two until we could locate Christmas. 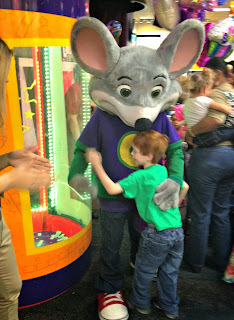 During Bay's birthday party at Chuck-E-Cheese (known commonly as the house of mouse hell), Morgan did really well. That is, until it came time to celebrate the actual birthday. If you've never had the "rock star Chuck-E-Cheese" experience, count yourself lucky. 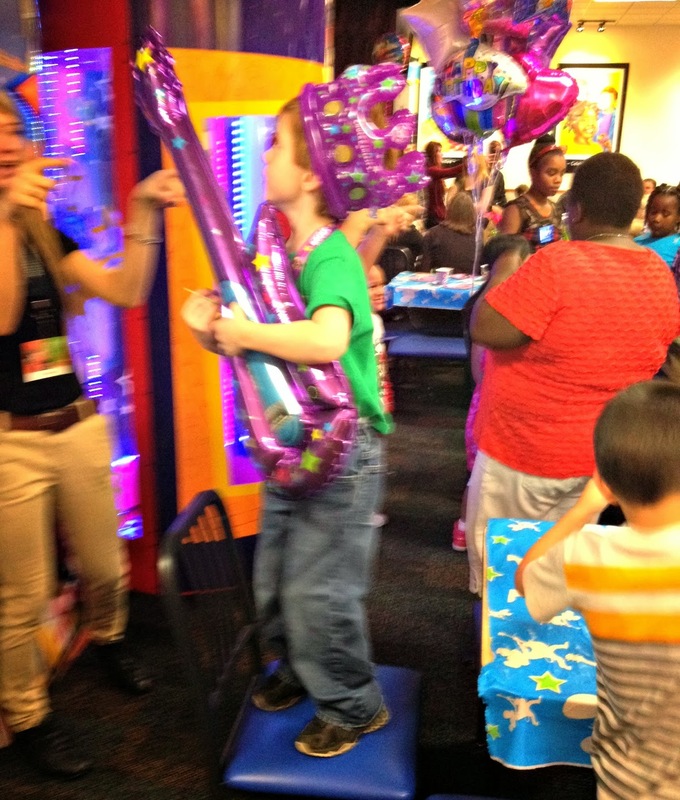 Imagine four or five televisions blaring music, people yelling for you to sing, kids screaming in excitement, the birthday kids "rocking out" (see pics below), and a giant scary mouse wandering from person to person, giving out hugs, all in order to pump up the kids. It's sensory hell on earth. So, while all of this was going on, one might wonder how Morgan was doing. He was just doing. He was stimming a lot by licking around his mouth, but he didn't want to leave. He said he wanted to "watch the show and Bay." But the noise hurt him, really badly. 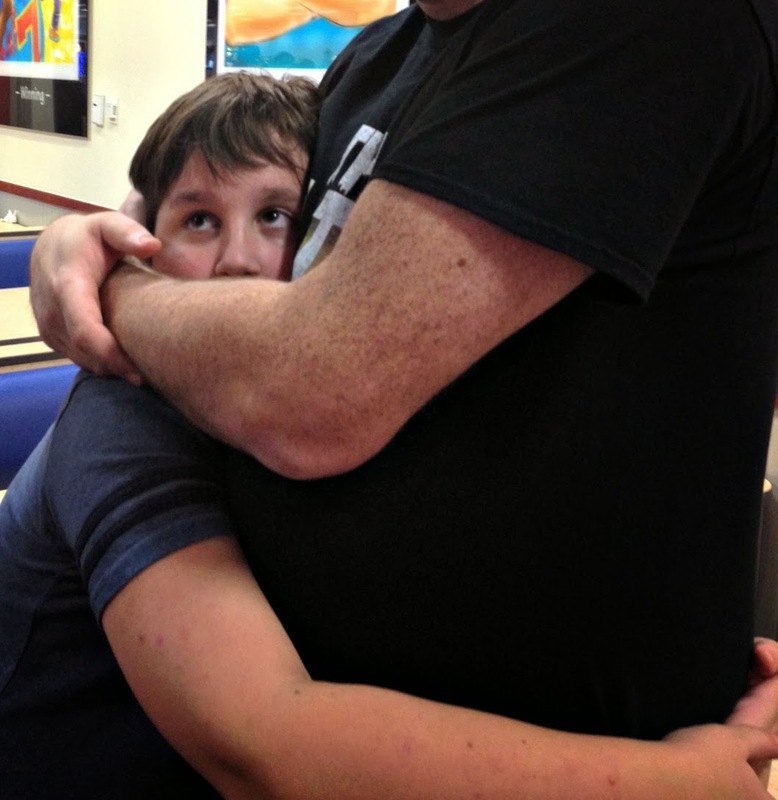 Morgan held tight to his daddy and Thomas held tight to him, with one hand over Morgan's exposed ear. I kept asking Morgan if he wanted one of us to take him to a quieter place, but no, he wasn't having it. He wasn't missing out on his brother's birthday party- because "that's what big brother's do (his words)." So we let him be and let him stick it out, though we both knew he was in hell. After, I high-fived Morgan for getting through that. He was sweaty and his face was chapped from all the licking he'd done. Bay told him, "Morgan, you did so great! Thank you!" Morgan grinned hugely and then when back to playing with his friend Baylee. The point in all of this is that we as a community tend to put siblings of autistics on pedestals when they stand up to bullies, include their autistic brothers and sisters in activities, etc., but we rarely hear about how great autistics are for their neurotypical siblings. Morgan is the "bestest" big brother I could ever imagine for Bay. I would have Morgan 100 times over just to give Bay the experience of having a brother who is as sweet, gentle, and loving as his older brother. Morgan is never intentionally cruel to his brother, nor does he yell at or purposefully hurt Bay's feelings. If last week was any indication, Morgan goes out of his way to ensure that Bay's feelings aren't hurt. He blows the theory of mind concept out of the water and makes it invalid for me. To give credit where it's due: Morgan, so far, has been a great brother, friend, and role model for his brother. That's how siblings are supposed to be, no matter the neurology. Love when siblings show that sort of love. I feel like I said love too much in that sentence. You might have. However, in this case, I'm willing to forgive it. What lovely boys! It warmed my heart reading this post. Like Jennifer, I hope my boys have this kind of relationship when they get older.